Foundation repair easily tops the list of our most popular, in-demand services. If you have followed our blog or social media for any length of time, you know foundation repair represents a lot of what we do at Reynolds Contracting. From helical piers to drainage management, we’ve got you covered. One newer technology in foundation repair that you may not be familiar with is carbon fiber strips. We’re the Charlottesville area carbon fiber experts, on the cutting edge of carbon fiber strip installation in Albemarle and surrounding counties. On this featured project, we installed carbon fiber strips on a bowing wall. We use the tension strength of the adhesive and the carbon fiber technology to prevent the wall from bowing any further. This reinforcement of the wall provides strength and longevity to your basement walls. But why would a wall do this in the first place? This problem differs from other common foundation issues we see when a foundation cracks or settles. The underlying problem, however, remains essentially the same: WATER. When water is not piped away from around your house, it finds a place o go on its own, usually down to the foundation or basement. Dirt on the exterior side of the wall becomes saturated, causing extra hydrostatic pressure. The wall is strong enough to hold dirt along, but add water and the wall can’t handle the weight. You can tell if your wall is under extra pressure because you will get horizontal cracking along the mortar joints. (Foundation settling or shifting usually causes vertical cracking.) Carbon fiber strips are an excellent solution because they are cost effective, require no heavy equipment, and can last a long time. 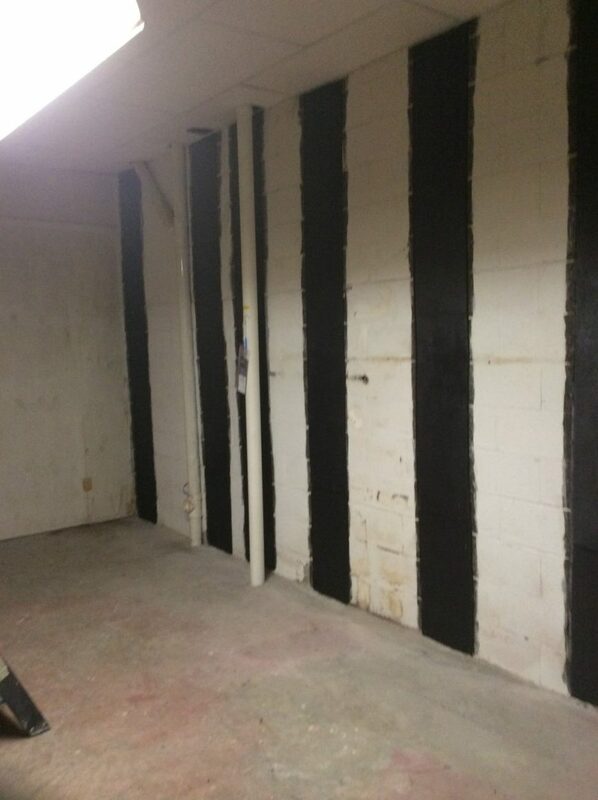 As the Charlottesville area carbon fiber experts, we can help with any bowing walls in your basement, or address any water drainage issues around the exterior of your home that could lead to bowing walls in the future. Give us a call today 434-293-6724 for a consultation!